Vermont naturally-raised turkeys and chickens are the world standard for healthy and tasty poultry. By allowing our turkeys and our chickens to roam in an un-crowded environment, we afford them the natural, stress-free life and healthy diet that nature intended. 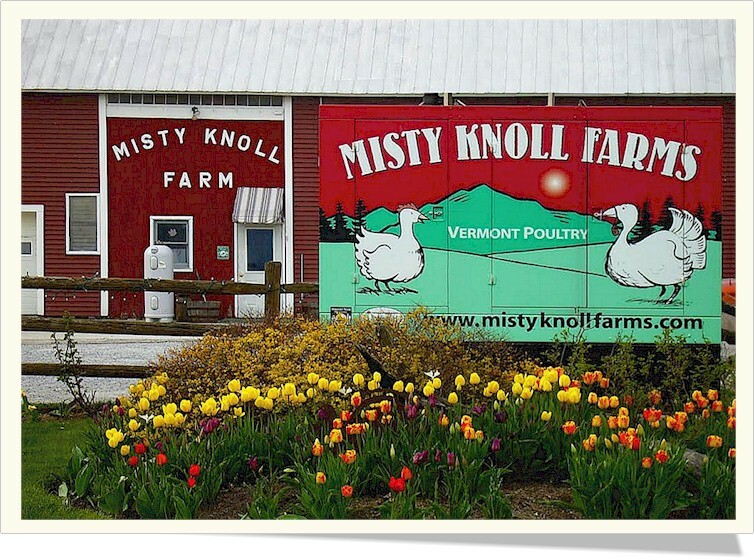 Misty Knoll Farms is a family-owned and operated farm producing the finest naturally raised turkeys and chickens available from Vermont. As stewards of Vermont’s working landscape, we treat our farm as a precious, irreplaceable natural resource, and follow sustainable farming practices to ensure our cropland will be productive for future generations. We raise our birds with the utmost care, feeding them whole grain, free of antibiotics and animal by-products. Our chickens and turkeys range free in spacious, specially designed enclosures. The result— healthy, nutritious, and flavorful birds nature’s way. By processing our naturally-raised turkeys and chickens on-site in our own USDA-inspected facility, they sustain much less stress. We carefully grade them by hand to assure that only the finest birds are available for sale. Look for our wonderful Vermont turkeys and chickens and other products in natural food stores, supermarkets, and in fine restaurants throughout Vermont and New England. Your satisfaction is guaranteed! Please enjoy our web site, where you may download delicious recipes, learn more about the healthy attributes of poultry, and order our birds at harvest time.